All Access Tree Care is proud to offer San Diego County's best value in tree care and removal services. We are a fully licensed and insured tree company that specializes in tree trimming, pruning, lacing, and shaping, crown thinning and raising, tree removal, and stump removal and grinding. 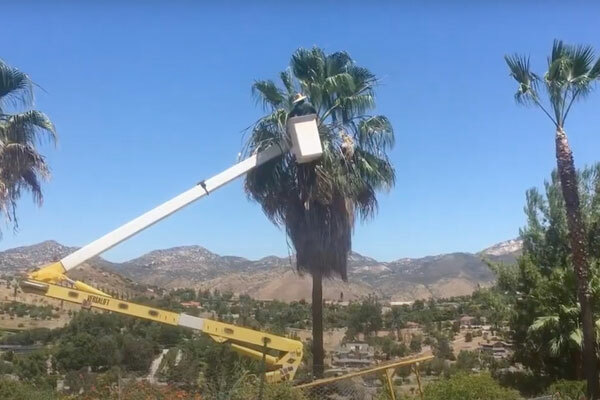 Over the last 20 years, we've served the tree care, maintenance, and removal needs of thousands of satisfied homeowners, HOAs, and commercial businesses throughout El Cajon, La Mesa, Poway, Point Loma, North Park/City Heights, Santee, Lakeside, La Jolla, Carmel Valley, and San Diego. We've earned excellent reviews on Yelp, Angie's List, and HomeAdvisor, and stand behind our services with an impressive customer satisfaction guarantee: We don't consider a job done until you are 100% satisfied with our work. While we offer superior-quality tree services, we still manage to keep our prices lower than most other state-licensed tree care companies in San Diego County. At All Access Tree Care, all of our tree services are provided by highly trained and skilled tree care experts with between 15 and 30 years of experience each. With their extensive knowledge, you can trust that we know how to properly care for and maintain all types of trees, including palm, olive, ficus, eucalyptus, acacia, oak, desert willow, gum, pine, pear, sumac, cedar, sycamore, and more. We can help you manage those that are overgrown, impeding walkways or views, or becoming a fire or safety hazard. Just let us know what you want to achieve, and we'll provide you with the guidance you need to meet your goals in accordance with the industry's best practices. When it comes to tree care and maintenance, we are always looking to keep trees safe and healthy. Because a healthy tree is a safe tree, we trim trees in a way that promotes healthy growth. By knowing where to cut and how much to cut for each tree species, we're able to help your tree look naturally beautiful and thrive. For trees that are unwanted or a safety issue, we also provide tree removal services. We remove trees, limbs, and stumps of nearly any size, and can either cut the tree into firewood, grind it into chips for mulch, or haul it away to a green waste recycler. Whether you know exactly what type of tree service you need or are just starting to do research on how to care for or remove a tree, give All Access Tree Care a call. We're available from 7am to 7pm, seven days a week, and provide free on-site consultations. Because of our commitment to complete customer satisfaction, you'll always deal with the owner. Our owner, Mike, oversees more than 90% of our jobs and ensures that every job is done right, the first time, every time. While we're on site, we'll take great care to protect your property, and once we're done, we'll thoroughly clean up so your yard looks better than before we arrived. All Access Tree Care completed this tree trimming service in Escondido, CA. Our client's tree was overgrown and blocking much of their front yard. Our expert tree trimmers carefully pruned the branches to ensure the tree would grow back healthier and stronger. These guys are awesome! I had two huge trees in my front yard that were damaging my block wall and concrete. They gave me a very fair price and had the trees out and the stumps ground down in just a few hours. All Access did a great job taking down a tree and some out of control birds of paradise in my yard. Mike is friendly, professional and honest. He even removed some trimmings in my yard for free!